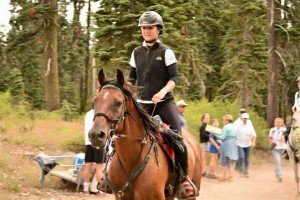 Would you jump at the chance to ride the Tevis 100-mile trail in California, with the previous year’s winner as your mount? “I first met Hillorie Bachmann whilst racing in Abu Dhabi for Emaar stables. I had been with this stables for only half of the season in the UAE so was really getting to know the people, horses and the track. Emaar looked after me so well in the races and I put a lot of trust in the trainers, grooms and the horses, which was invaluable for a newcomer. Hillorie gave me sound advice and supported me throughout the races, and our friendship soon grew to outside the endurance scene. I had never met such a strong, smart and still beautiful woman and I admired her in every aspect. She is my role model.